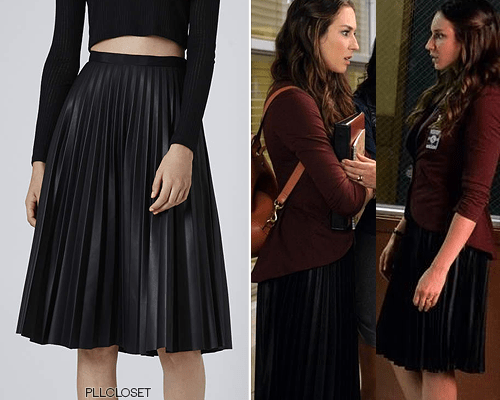 Here were my favorite looks from Tuesday’s episode of Pretty Little Liars. Each girl had a look that I really liked. This was my favorite outfit from 6×04. 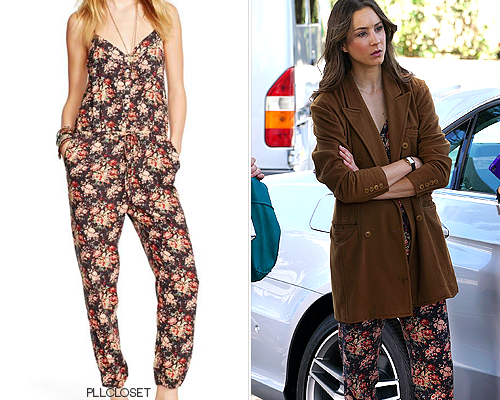 The jumpsuit is so boho and chic for the summertime. Spencer keeps the look preppy with this gorgeous brown jacket. I love how loose the jacket is, and it pairs well with the jumpsuit. 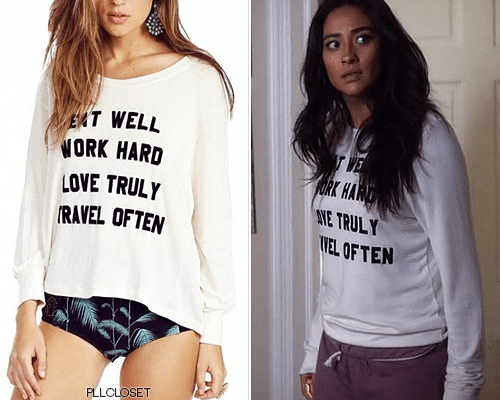 I recently bought a necklace that reads: Eat Well, Travel Often, so I loved seeing another version of the saying on Emily’s jumper. I really love sayings and quotes on tank tops and sweaters. It’s casual, cute, and the sayings are true. 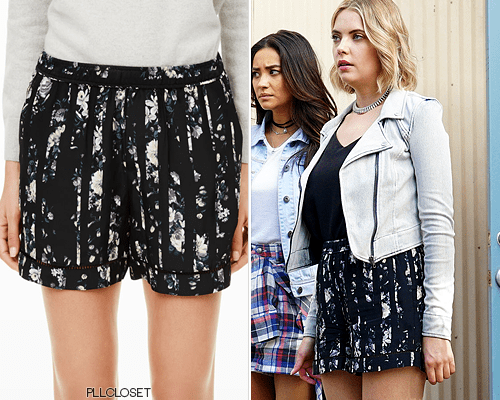 Patterned shorts are very popular this season, and I liked the mix of flowers and stripes on these shorts. They were paired well with a moto jacket. There were a lot of jackets this episode. This jacket was edgy and fun. I love the asymmetrical cut of the jacket. 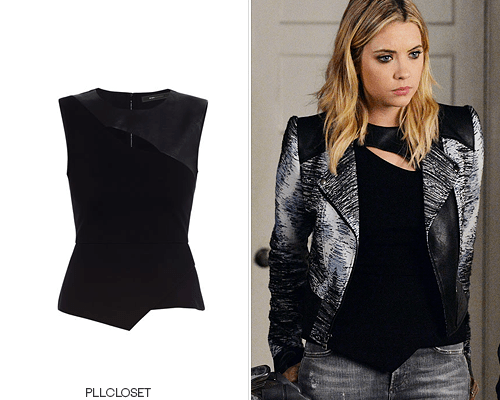 I would pair it with all black knowing my style, but I really liked that Aria paired the jacket to tone down her crazy zebra romper. Her style is always a surprise every episode. 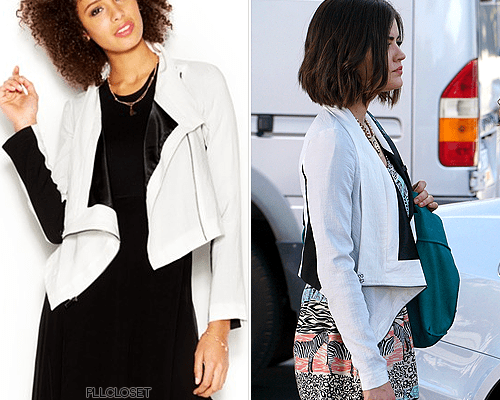 On the last episode of Switched at Birth, I noticed that there were a lot of jackets.I turned to WornOnTV to get the details of each jacket worn! You should check out the website because it updates all the clothing pieces worn on a bunch of television shows such as Nashville, Revenge, Modern Family and much more!